The winners have just been announced of the Microsoft Imagine Cup and they have created a very interesting product, worthy of a look I feel and also of the $25000 prize money. The Quad Squad team is a group of students based in Ukraine, and they have designed a pair of gloves that are able to convert sign language into sounded speech. 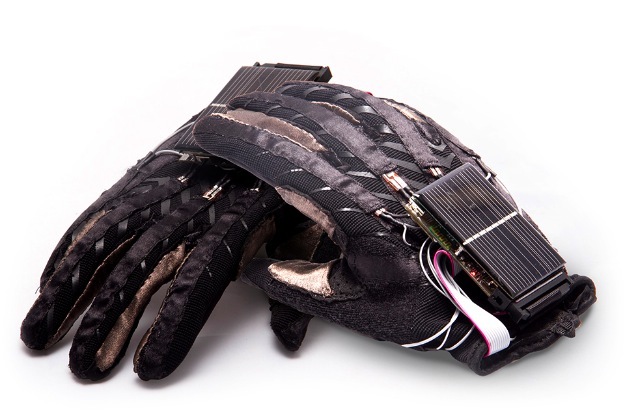 The gloves are fitted with sensors that can read letters as displayed in sign language. Software then interprets the signs and produces the spoken sound through mobile phone technology. A pair of sign language conversion gloves. The designers hope that their product will enable communication between someone speaking using sign language and someone who cannot read sign. Incidentally they have small solar panels fitted so they can recharge themselves while in use. Comments on the Gizmag blog point to limitations, the gloves can only presently recognize letters and not symbols for words, but all agree that the product is definitely a step in the right direction. If your sign language is not up to scratch you might like to try a pair of Accelagloves. These gloves use a mixture of sensors, software and a video camera attached to your computer to teach the signing of letters. They cost $300 (including software) and are already available from the Institute for Disabilities Research and Training who worked on their development. The Endgadget website offers a demonstration and the author’s verdict on their efficiency in video format. The gloves are not only designed as a learning tool however, but also as an input for your computer as communication between gloves and computer is two way. Not only do they teach the symbols but they allow the user to input data through sign language, another important use in cases where visual or audio contact is not possible or the input device cannot be easily held (in emergency situations for example). If your signing is already good you might like to try a pair of Glow Gloves. A simple idea that enables sign language in the dark, they do exactly what it says on the box. I worked in a school in Italy where sign was taught as a curriculum subject, and now my youngest son is learning it at pre-school, but from my own point of view it remains an underused resource. Maybe this technology could help to spread its use to a larger group of people. Very good, I like the glowing gloves bit! Hopefully this sort of technology will soon be obsolete, as we will be able to help people regain their hearing, potentially via prosthetic ears. Or am I dreaming a bit too far into the future? Well, i have had experience of this as my son has had hearing issues. If the ear is damaged then a prosthetic ‘ear’ might help, but if the nerve that carries the signal into the brain does not work or for some reason the brain does not process the signal then you have a much more serious problem. They can test this transmission using something called ABR, you will have to look it up though. Wow, video on the BBC about the exact gloves you talk about Jonny! You broke the news here more than a month before the BBC did!